'It is vital for Tibetan Buddhism, but it is also in India's political interests,' says Claude Arpi. Recently, an article titled The Dalai Lama has chosen his successor appeared on an Indian Web site. Tibet watchers did not take the content seriously because the same author had earlier announced the Dalai Lama's imminent death. One has just to look at the report of the Dalai Lama's recent visit to Europe to understand that the Tibetan leader's health is fine even if he may have less energy than a few decades ago. Who of his age would not? However, the Dalai Lama's succession is a subject which concerns India as the religious leader took refuge in this country in March 1959 and more than a lakh of his followers live in India today. Whether the Dalai Lama decides not to reincarnate (which is doubtful), or to take a new body or else to 'emanate' during his own life time into a young child, Delhi and the people of India are personally and politically concerned. In this sense only, the article cited above is relevant. While the situation around his 'return' is rather unclear, the Dalai Lama remains a rock of serenity, virtues and stability in the chaotic world of Tibetan Buddhism. It is not necessary to mention here the scandals which have recently rocked the Tibetan Buddhist world, with some so-called high Lamas being accused of sexual misbehavour and debauchery. The 'Succession' is probably the reason why a meeting of the heads of the different schools of Buddhism has been called in November in Dharamsala (incidentally, when the first such meeting was organised in 1966, also in Dharamsala, India was represented by Kushok Bakula Rinpoche of Ladakh). In the Dalai Lama's own Yellow School, the situation is rather confused. Traditionally in Tibet, the Panchen Lama was the second most prominent religious figure. Following the passing away of the 10th Panchen Lama in January 1989, the Dalai Lama formally proclaimed a six-year-old boy, Gedhun Choekyi Nyima, as his reincarnation on May 14, 1995. Three days later, the Chinese government arrested him; he has never been seen again. He also said that the existence of two 11th Panchen Lamas may not be all that unusual in Tibetan Buddhism; he was citing historical instances for this. Not easy to understand for common men: Two Karmapas, two Panchen Lamas! Reason tells us that it makes no sense for the Dalai Lama to not reincarnate, his presence is needed too much by the people of Tibet for him to dispense himself from 'returning'. Further, his 'non-reincarnation' would be a boon for China who is bound to discover its own 'Dalai Lama'. Returning in the West makes not much sense either; apart from being close to a large following among the Western neo-Buddhists, what would the Tibetan leader gain? Returning in Tibet under the present circumstances is not viable, it can therefore be discarded as a place of rebirth; in any case the Communist authorities have already planned his 'return' through Communist party regulations. The 15th Dalai Lama would have to be a Communist first and then a religious leader. Further, he would not be permitted to stay in Tibet (even Gyaltsen Norbu, the Chinese-recognised Panchen Lama, is only allowed sporadic visits to Tibet). Other Asian countries also seem difficult as the Tibetan leader is today not welcome in most Asian Buddhist countries such as Thailand, Sri Lanka, Myanmar or Bhutan. This is due to 'political' pressure from China, but also due to the fact that some of these countries practice Theravada Buddhism. The best bet would, of course, be India, where he would be most welcome by both the people and the government (even if Delhi does not say so openly, to not upset China). The Dalai Lama has repeatedly stated that he is a Son of India and his favorite food is dal and chapattis; further, for him, India is Aryabhumi, the Land of the Buddha. The choice is between a reincarnation and an emanation; the latter seems more adapted to a modern system of governance which cannot afford a gap of 20 years or so in leadership. Historians realise that the 'Rule by Reincarnation' has in the past cost Tibet its independence as the regents were most of the time incapable of ruling the country. In 1947, Tibet was even on the brink of a civil war due to the infighting between the two regents. During the 19th century, the Manchus may have found the trick, before the new Dalai Lama would reach majority, he would suddenly pass away in mysterious circumstances. This allowed the Ambans, the Chinese representative of the emperor, to impose their diktats in the Land of Snows. What would be a positive solution? This leaves little alternative to the Tibetan leader who will have ultimately to take the call. But for India, the best would be if he announces that he will 'return' as the 15th Dalai Lama from Ladakh or alternatively from another Himalayan region such as Kinnaur or Spiti. It could be either in a new body or as an emanation in a young boy born in a refugee family. An emanation would have the advantage that the chosen boy could be groomed and 'initiated' for several years by the present Dalai Lama himself. 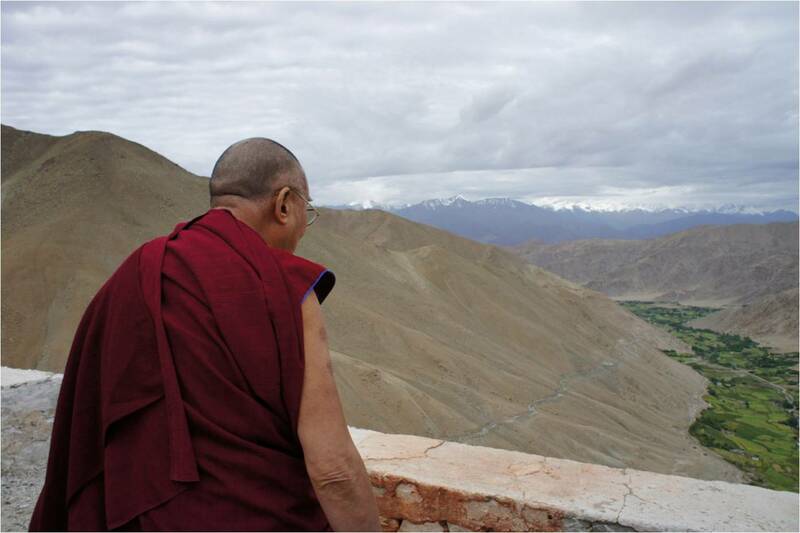 Ladakh has many advantages: The present Dalai Lama is deeply connected with the mountainous region of Jammu and Kashmir which he visits every year. Ladakh would be an interesting alternative as it would also be a political statement. The fact that Beijing keeps the border between Tibet and Ladakh closed since 1962 despite Beijing's great love for old trade routes is telling. Why has Beijing never permitted the reopening of the traditional route to Kailash Manasarovar via Demchok in Ladakh? Simply because China has never officially accepted Jammy and Kashmir's accession to India in 1947. Ultimately, the Dalai Lama's presence in India is crucial, especially for the stability of the border areas. In the meantime, China is already prepared to have its own Dalai Lama. In July 2007, the party-State announced the 'State Order number '" or 'Management Measures for the Reincarnation of Living Buddhas in Tibetan Buddhism'. The 14 articles of the Regulation effectively control the system of reincarnation. It means that only the Communist party, through the State's Buddhist Association, can decide. This would indeed facilitate all sort of manipulation. China is presently extremely active on the 'succession' front. Xinhua recently reported that Gyaltsen Norbu worshipped at the Lhamoi Lhatso lake in Gyatsa county of Lhoka prefecture in the Tibet Autonomous Region. The official Chinese news agency asserted that it was the first time that Gyaltsen Norbu visited the holy lake, famous for the visions that a regent or a high lama can have in it. It is the way the present Dalai Lama was found. Regent Reting Rinpoche went to the lake in 1935 and had several visions; he saw the roofs of the house of the young Dalai Lama who was just reborn in a remote village of Amdo province (now Qinghai). There is no doubt that China is preparing for the rebirth of the present Dalai Lama. In the present planetary turmoil, while wishing the Tibetan leader a long and healthy life, one can hope for a 'selection' of the Tibetan leader in the Indian Himalayas. It is vital for Tibetan Buddhism, but it is also in India's political interests.